Frederick Miner Sr. is thought to have been born in 1777, the son of Western Pennsylvania pioneers Jacob and Maria (Nein) Minerd Sr. He and his brother Daniel were pioneer settlers of Perry County, OH. At last count, Frederick and his wives together produced 13 children, 51 grandchildren and at least 124 great-grandchildren, virtually all born before the year 1900. Their children were John Minor, Henry Miner, Elizabeth Bush, Rebecca Bateson, Barbara Houser, Nathan Miner and Sarah Miner. Frederick had a close relationship with his brother Daniel Sr. In about 1812, they left Pennsylvania and moved to southeast Ohio. In December of that year, they jointly bought land in Sego, Perry County, OH. They purchased their tracts from the U.S. Land Office at Zanesville, Muskingum County, OH. Frederick also bought his own separate farm in mid-October 1813, agreeing to pay the price of $334.40. Brother Daniel also bought a separate farm near on what now is the town of Mt. Perry, which he sold after a few years. Also migrating to Perry County about the same time was their sister Catharine Ream's brother in law, Samuel W. Ream (1779-1858) and his wife Rachel (King) Ream (1781-1856). Seen here is an old photographic postcard showing the land office at Marietta, Washington County, OH, which may represent what the Zanesville land office looked like as well. Frederick and Daniel only kept the jointly held farm for a few years, presumably holding it on speculation. 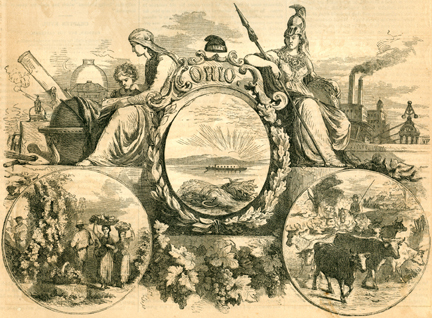 On May 10, 1817, after they had owned it for five years, they completed their sale to one Henry Gordon who made the final payment, giving him title to the land. Each year between 1813 and 1817, Frederick made installment payments on his own farm, occasionally doing so early and receiving a small discount. On Sept. 29, 1817, Frederick paid his final installment to the Land Office in the amount of $39.85. Three months later, on Dec. 10, 1817, his official patent (#2346) was signed by President James Monroe and Josiah Meigs, Commissioner of the General Land-Office. Frederick received the patent some time later, and the document must have been a source of unending pride. He lived on his farm for the rest of his life -- nearly 60 years. Five years after Frederick received his land patent, heartache rocked the family when wife Betsy died at the age of 40 on May 4, 1822. Her grave marker, misspelled "Minner," is seen here, one of the oldest known gravestones in our family. Betsy was buried in the same row of graves as her sister in law, Mary Minor, in the Hopewell Church Cemetery west of Sego. The fact of the adjacent burials has been an important clue in demonstrating that the two families -- Frederick's and Daniel's -- were related. On Nov. 11, 1824, when he was age 47, Frederick married his second bride, 28-year-old Jane Richardson (1796-1839), by the hand of T. Flood. A record of the marriage today is found in Muskingum County, OH. She is believed to have been a widow, but nothing further is known of her origins. Jane brought a daughter, Elizabeth Richardson, to the marriage. Frederick and Jane had five more children of their own -- Frederick Miner Jr., Andrew Jackson Miner, Thomas M. Miner, Catherine A. Miner and Mahala Ann Johnson. The shadow of death struck the family again in 1839, after 15 years of marriage. 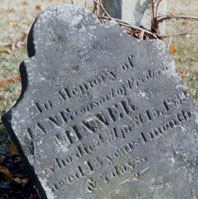 On April 15 of that year, Jane died at age 43, and was buried at the Hopewell Cemetery. 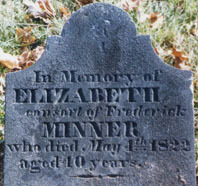 Her grave marker, also misspelled "Minner," is seen here, and is in the same row of graves as Frederick's first wife. Frederick later became a companion of Sarah Goble ( ? - ? ). As an adult, Frederick also suffered the deaths of an infant daughter (Sarah) and three adult children. Daughter Barbara died at age 27 at Rushville, OH, in 1843, the mother of four youngsters. Son Andrew, a soldier in the Civil War, gave his life for our nation near Atlanta, GA, of chronic diarrhea. Son John fell to his death at an ice-house in Salem, OH in 1866. It's known that the Miners' physician was Dr. John Watkins, who treated the family prior to the Civil War. Frederick remained on his farm, seen here near Sego (as it looked in 1991), until his death. The village of Sego was named after a town in Africa, and earned the nickname "String Town on the Pike." During Frederick's lifetime, the town was the home of Congressman Ritchie, and as a boy, Dr. Thompson, President of Ohio State University. Frederick Minerd, of Perry County, Ohio, ... died there in May, 1871, about a week after the writer visited him. He was well advanced in years, and lived with a daughter, Mrs. David R. Johnson. I saw him fall with heart trouble in the morning. I bade all adieu, and returned six months later. Frederick actually died on August 3, 1871, not in May, as Harbaugh had reported. Frederick was age 94 at the time. He was buried beside his wives and several children. Frederick's estate was settled by son in law David Johnson. Shortly afterward, the Johnsons migrated westward to Kansas.